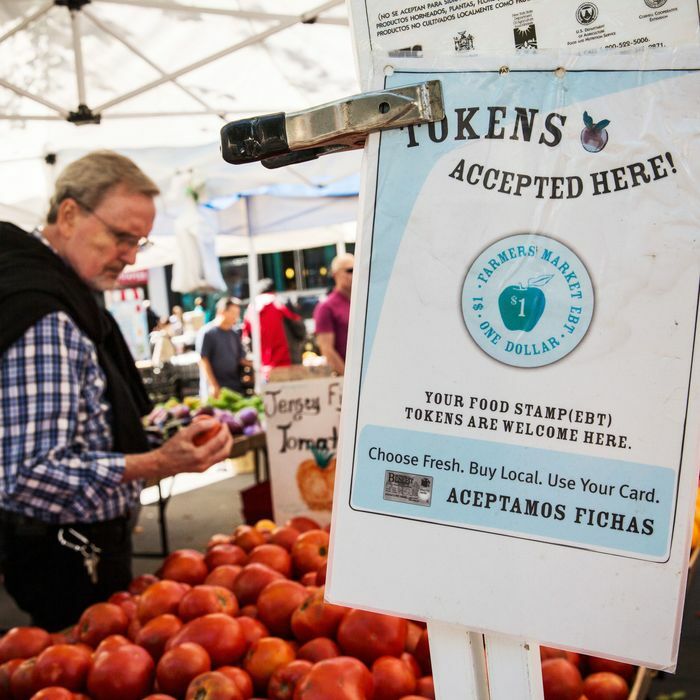 A nonprofit group will use its own funds to temporarily extend a payment platform that allows SNAP recipients to buy food at thousands of farmers’ markets across the country. In a statement, the National Association of Farmers Market Nutrition Programs announced that it can fund the system for 30 days. The new deadline to fix a looming crisis will come at the end of August. Earlier this month, the tech company that facilitates crucial components of EBT card transactions said that it would cease operations by July 30. Josh Wiles, who co-founded Novo Dia Group, an app provider, said low profits played a role in the decision to shut down, along with the USDA’s award of a $1.3 million contract to a new company that intends to steer the payment program in a new but unspecified direction. As with any government-funded program with federal and state levels, there are a lot of moving parts, but to recap: Tablets and phones outfitted with custom software currently make it easy for users of SNAP, the program once known as food stamps, to convert their benefit money into market-specific currency, such as tokens and an incentive program known as Health Bucks here in New York City. For the most part, the transaction is mediated through Mobile Market Plus, Novo Dia’s app, and hardware that allows SNAP users to swipe their EBT card like a debit card. Food and Nutrition Service (FNS) administers SNAP through the USDA. Last year, the agency’s contract with a group called Farmers Market Coalition (FMC) ended. FMC had previously worked with Novo Dia on the platform, which still powers EBT farmers’ market transactions across the country. But since April, Financial Transaction Management (FTM), the government’s replacement contractor, has been mostly silent. Wiles said no one at FTM reached out to carve out a strategy going forward. “Our assumption was that we would be able to, for lack of a better word, bid,” he said. On Saturday, a USDA press release about these issues did not explicitly name Novo Dia Group, but FNS administrator Brandon Lipps called the potential disruption to SNAP service at markets a “great concern.” July 14, the date of the press release, also happened to mark the previously announced date for FTM — a company with one listed employee and no online footprint, which booted up a month before FMC’s contract expired — to start taking orders for new equipment. That apparently hasn’t happened, and in any case, it’s not entirely clear how the Food and Nutrition Service is planning for the longer term. In its release, the agency emphasized its role in relation to individual states’ programs, and said it will “modernize the approach [to SNAP at farmers’ markets] by employing a bring-your-own-device model” for transactions. “FTM has no role in supporting those markets equipped under previous contracts,” it wrote. That statement doesn’t make much sense. More than 20,000 New Yorkers used SNAP benefits at GrowNYC markets last year, for a total of 60,000 transactions. Considering that SNAP users in the city spent more than $1 million total at GrowNYC markets alone last year — the city is home to 1.7 million SNAP recipients — along with the fact that the size and inventory of markets thin out in colder months, and it’s not unreasonable to suggest that local farmers stand to lose more than a hundred thousand dollars for every few weeks there’s no forthcoming solution. In an interview with Modern Farmer, Phil Blaylock, executive director of NAFMNP, indicated that the group might be eyeing a more substantial fix. “We’re having to do this in steps primarily because of the machines of government,” he said.